encourage municipalities to review their commercial building codes regarding exposed polystyrene insulation. Figure. At the scene of the fatal fire. On February 11, 1998, two male fire fighters were fatally injured while fighting a fire at a commercial tire service center. The two fire fighters (the victims), along with 8 to 10 other fire fighters and officers, entered the front door of the showroom and observed only light haze. However, when they entered the service area, black smoke covering the top one-third of ceiling space was encountered, but there was no visible fire. From the smoke in the showroom, it was evident there was a smoldering fire somewhere, but none of the fire fighters could locate the origin. Both engine and truck officers made extensive interior sweeps of the service area. However, within minutes, all fire fighters in the interior of the building were caught in a hazardous backdraft that claimed the lives of two fire fighters, and nearly claimed all those who were inside. On February 17, 1998, Ted A. Pettit, Chief of the Trauma Investigations Section, and Frank Washenitz, Safety and Occupational Health Specialist, traveled to Illinois to investigate the circumstances surrounding the deaths of the two fire fighters, and the near fatal injuries of 8 other fire fighters. Meetings were conducted with the Illinois Department of Labor investigators, the public affairs officer for the fire department, the director of employee relations, officers from the air-mask service, safety officers for the fire department, the chief of the training academy, fire department officers and fire fighters that responded to the incident, and the president and vice-president of the IAFF Local #2 union. A site visit was conducted of the incident site, and pictures of the structure were obtained from the fire department. The fire department involved in the incident serves a metropolitan population of 2.7 million in a geographic area of 224 square miles. The fire department is comprised of approximately 5000 employees, of whom 4200 are fire fighters. The fire department provides all new fire fighters with an extensive 4-month (65 training day) training program at their fire department training academy, which covers all aspects of Level I and Level II fire fighters training, and recommended by the National Fire Protection Association. Upon successful completion of academy training and passing the Fire Fighter Level II examination, a fire fighter is assigned to a station. The department also requires that each fire fighter receive 2 hours of training per shift. One victim had 2 years of fire fighter experience, with 18 years of paramedic experience, and the second victim had 9 years of experience as a fire fighter. Although several fire companies were involved in this incident, only those directly involved up to the time of the fatal incident are cited in this report. 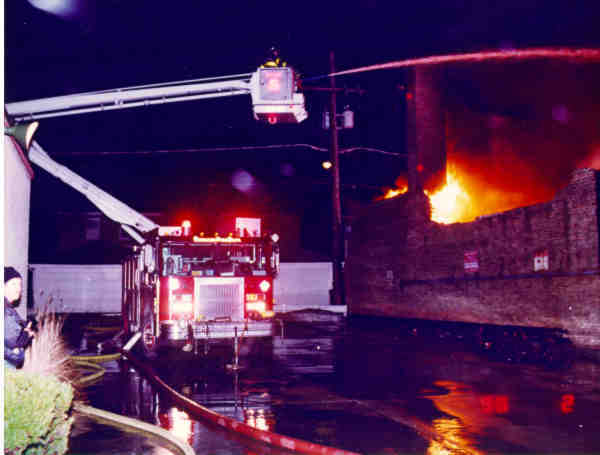 On February 11, 1998, at 2224 hours, the fire department received a call from the occupant of a private residence at the rear of a commercial tire service center, stating there was a fire in the interior of the building. The service center (site of the incident) was constructed of masonry block with a brick facade on a concrete slab foundation. The center measured 150 feet wide by 62 feet in depth, with a glass showroom attached to the front, measuring 75 feet by 55 feet (figure). Above the parts room was a cockloft (unfinished area below the roof), where tires, Christmas decorations, and miscellaneous items were stored (believed to be the area of origin of the fire). The cockloft was accessible from the service area. The roof system of the service area was constructed of open wooden bow-string trusses, with unprotected polystyrene insulation glued to the underside. The exterior of the roof was a rubberized material, which had recently been repaired. The entrance to the service area was either through a standard passage door from the showroom into the service area, or through an exterior metal garage door (entrance for cars to be serviced), which was raised and lowered by an electric automatic motorized system. Those units responding initially were Engine 92 with a Lieutenant, Engineer, and 2 fire fighters (normal complement is five fire fighters), Engine 120 with a Lieutenant, Engineer, and 3 fire fighters, Truck 24 with a Lieutenant and 4 fire fighters, Truck 45 with a Lieutenant and 4 fire fighters, and Battalion 21. At 2228 hours, Engine 120 was the first company to arrive at the service center, with Engine 92 being the second company on the scene, then Truck 45, Truck 24, and Battalion 21. None of the fire fighters reported seeing any fire or smoke, so one of the fire fighters radioed back to dispatch to verify the address. The address was confirmed by dispatch, and at the same time a neighbor told the fire fighters he saw fire at the rear of the building. At approximately 2230 hours, the owner of the business arrived to unlock the front door to the showroom. Approximately 8 to 10 fire fighters from the first-arriving companies entered the showroom; some fire fighters reported no smoke showing, others reported observing a light haze in the showroom, with the odor of a burning car. They opened the door to the service area, where black smoke covering the top one-third of ceiling space was encountered. They entered with a charged 1 3/4-inch hose line, which was connected to a 2 1/2-inch leadout line. The Lieutenant from Engine 120 walked deep into the service area along the wall to the South in an attempt to locate the light switch panel. The fire fighters indicated that at no time did any them feel any excessive heat or see any fire. When the fire fighters entered the building, two fire fighters from Truck 45 in front of the building, and two fire fighters from Truck 24 went to the rear of the building. They ascended ground ladders to the roof to cut ventilating holes in the roof with axes. The fire fighters on Truck 24 stated that there was no smoke or fire showing when they arrived at the rear of the building; however, they noticed the windows were dark and smoky. One fire fighter punched a small hole in one window with an axe tip, and black smoke billowed out. This was seen and heard by the truck Lieutenant inside doing his survey in the service area. Within 5 to 8 minutes, the four fighters on the roof had chopped a ventilation hole, approximately 4- or 5-foot square. When they peeled back the opening, black smoke was emitting from the hole. However, within 30 seconds, flames also started roaring up through the opening. All four fighters immediately picked up their equipment and descended the ladders to the ground. At approximately 2243 hours, the 8 to 10 fire fighters and officers who were inside the building had advanced some 15 to 20 feet into the service area where thick black smoke was above them. They reported running into each other because of the poor visibility. At approximately 2245 hours, without warning, hot gases that had accumulated along the 20- foot-high ceiling ignited, causing a backdraft situation. This created a pressure wave, knocking the fire fighters off balance and to the floor (it is conceivable that just before the time of ignition, the overhead garage door into the service area was self-activated and raised, allowing additional air to fuel the fire – this was determined by an examination by the city electrical inspector and an electrical engineer that the motor and drive chain assembly had definitely opened electrically as a result of the fire shorting out the low voltage side of the switch wires). The fire fighters became disoriented, could not find the hose, and were scrambling and yelling in an attempt to escape the inferno they had been caught in. Additionally, the molten polystyrene insulation from the ceiling area falling down on them. One of the fire fighters who had managed to escape through the service door to the showroom, later said you could hear fire fighters running into and knocking over things, yelling, and screaming, trying to escape from the burning structure. One fire fighter dove through the office window to escape the burning building. The escape from the service area was complicated by the 20 cars stored in the service area, the intense heat, heavy black smoke, disorientation and panic from being trapped. When the fire fighters exited the burning structure, an immediate head count was taken, and it was discovered that two fire fighters were missing. Rescue attempts by fire fighters to reenter the structure were numerous but futile, as the entire service area became fully involved with fire, prohibiting entry and rescue the missing fire fighters. Within 30 minutes, the entire truss roof collapsed into the structure. According to the medical examiner, the cause of death for both fire fighters was carbon monoxide intoxication due to inhalation of smoke and soot. Discussion: At a minimum, initial evaluation or size-up of a fire should include the following: (1) the fire is evaluated for size and location, (2) the structure is evaluated for the combustible construction, occupancy, floor area and height of the building, (3) exposures are evaluated in terms of hazards to life and/or hazards to nearby buildings from flame damage and smoke, and (4) the resources at the scene are evaluated for their ability to extinguish the fire. Resources include the number of apparatus, fire fighting personnel, water supply, and auxiliary appliances. Other unpredictable factors should also be evaluated, such as the time of day of the fire (day/night) and the weather conditions, such as extreme heat or cold. Circumstances sometimes are encountered where size-up is a process of information gathering conducted by incident command and company officers, in an effort to determine the size and progression of the incident. Discussion: Since smoke is the main killer at fires, roof venting can be a life-saving tactic in an occupied building. Ventilation is also necessary to improve a fire environment so that fire fighters can approach a fire with a hose line for extinguishment. However, window and door ventilation should be coordinated with fire extinguishment. Only after a charged hose line is in place and ready for extinguishment is ventilation of windows and doors most effective. Command should determine if ventilation is needed and where ventilation is needed. The type of ventilation should also be determined, based on evaluation of the structure and conditions on arrival. Discussion: When fire fighters are conducting an interior attack, there is a hazard potential for a backdraft or flashover. Backdraft is an explosion caused by the rapid ignition of fire and gases occurring in a burning or smoldering confined area that has been closed up, thereby decreasing the necessary oxygen for complete combustion. The trigger for a backdraft explosion is a sudden increase in the percent of oxygen by volume, i.e., the introduction of fresh air, which enters the structure during the initial search and entry operations, or various other operations. Flashover occurs when there is rapid ignition of heated fire gases and smoke that has built up at the ceiling level in a burning or smoldering room. Flashover is caused by thermal radiation feedback. When all combustibles and fire gases in the space have been heated to their ignition temperatures, simultaneous ignition of the entire room occurs, involving the entire interior space/room. As demonstrated by this incident, the hazardous conditions of a backdraft can be present without any typical signs, such as heavy grey/yellow smoke pushing out of building joints, roof vents, and skylights. Discussion: Fire fighters conducting roof ventilation can see important size-up situations not visible to the fire commander at the street level. Roof condition should be communicated to the command officer, relaying information about the presence of roof construction, fire conditions before and after ventilation, and other unusual conditions. This will assist the command officer in developing a plan of attack and strategy. Discussion: Fire departments should conduct pre-fire inspections of buildings within their district on a cyclical schedule. Those code violations that are discovered and that affect other agencies, such as building departments, electrical, etc, should be brought to the respective agencies’ attention. The unprotected polystyrene glued to the underside of the truss roof in the service area could constitute a building code violation. This also provided a condition which provided abundant fuel to the fire which was probably of a long smoldering origin, at or near an improperly operating exhaust fan (report by the fire department’s office of fire investigation) which was located on the roof, directly above the parts room area. This long smoldering process allowed combustible gases to accumulate on the interior of the truss roof, thereby, setting up conditions for a backdraft or flashover. Familiarization with the interior of buildings within a municipality will assist fire fighters and fire officers during a fire situation or emergency. 6. National Fire Protection Associiation, NFPA 1201, Chapter 14 Code Enforcement, NFPA, Quincy MA, 1994. Figure 1. At the scene of the fatal fire. Figure 2. Diagram of the fire scene.